Thanks to our wired world, an article recently published in Animals on media attention to animals has gained wide media attention. In “Cecil: A Moment or a Movement? 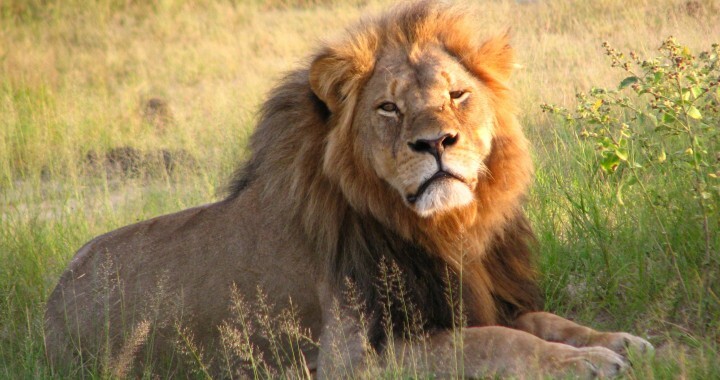 Analysis of Media Coverage of the Death of a Lion, Panthera leo,” biologist David Macdonald and co-authors examine the media coverage following the killing of Cecil by an American hunter in Zimbabwe on 2 July 2015. Macdonald and his team at the University of Oxford’s Wildlife Conservation Unit (WildCRU) had studied Cecil and other lions in the region since 1999. Three weeks after Cecil’s death, the story came to the attention of American talk show host Jimmy Kimmel, who urged viewers to protest the killing and support WildCRU by visiting the website. Soon, 4.4 million hits caused the WildCRU and Oxford sites to crash. Although protest had begun prior to Kimmel’s coverage, within a few days the story exploded worldwide in both traditional and social media. By the end of July, more than 99,000 articles and social media posts about Cecil were appearing each day. By analyzing the coverage in collaboration with a media monitoring company, the authors found that while a majority of stories appeared on social media, the remaining coverage came from editorial sources. Because both media sources peaked at the same time, the story was more than an emotionally driven viral campaign. Moreover, stories appeared in 127 languages. Interest was high in North America, but also in Australia, Asia, South America, and Africa. Thus, interest in Cecil does not simply constitute a “first world problem,” originating solely in wealthy nations, but a global phenomenon, thus raising hope for the future of animals in general and African wildlife in particular. However, the article raises questions as well as hopes. The authors also point out that, despite public indignation over trophy hunting, the practice raises significant funds for wildlife conservation in Africa. For example, big game hunting in South Africa brings in over $744 million each year, mostly from American hunters. Walter Palmer, the hunter who killed Cecil, had paid over $50,000 and obtained appropriate permission. At present, many African nations preserve more land for hunting than for national parks. Ending hunting altogether might result in the conversion of existing habitat to more lucrative uses that would not take the future of lions and other predators into account. It remains unclear what amount of money and from what sources, would replace the revenue from trophy hunting should the practice be made illegal. In addition, the article raises questions about what generated interest in Cecil, in particular, when the killing of lions occurs routinely. Between 1999 and 2015, for instance, hunters killed approximately 65 lions in the same area, yet none attracted the attention generated by Cecil’s death. The fact that Cecil became known by his nickname, rather than his data code of MAGM1, might explain some of the appeal. However, the authors point out that hunters have also killed many other named lions and the events have gone unnoticed. In the United States, the 2015 killing of a famed grizzly bear in Yellowstone National Park did not generate similar outrage. The unknown hunter who killed bear No. 211, known as Scarface, was apparently uninterested in trophies, for he left the bear’s body behind. It took only a month for Cecil’s story to go viral, but Scarface has yet to have his moment. And when a tiger named Ustad, suspected of mauling a ranger and killing two other men in Ranthambore National Park, was tranquilized and moved to a zoo, news of the event was barely heard outside India. An online petition on Ustad’s behalf generated only 4,000 signatures. The research on the “Cecil Moment” points out the unique combination of factors that made the story go viral. It also emphasizes importance of putting the public’s outrage to use on behalf of conservation. The effort will require the combined knowledge, skills, and resources of biologists, conservationists, hunters, social scientists, politicians, and others. Turning the Cecil Moment into the Cecil Movement will require strategies that allow a burgeoning human population to co-exist with wildlife. There is no time to waste if we do not want the Cecil Moment to become yesterday’s news. Posted in Animals, Uncategorized and tagged animal welfare, cecil, conservation, movement.